We are your “Wings to the Wilderness”! Our flight-seeing tours are a wonderful way to see the wilderness and the beautiful Lakes District. Our floatplane flights are a great experience especially for those who have never been in a small plane. 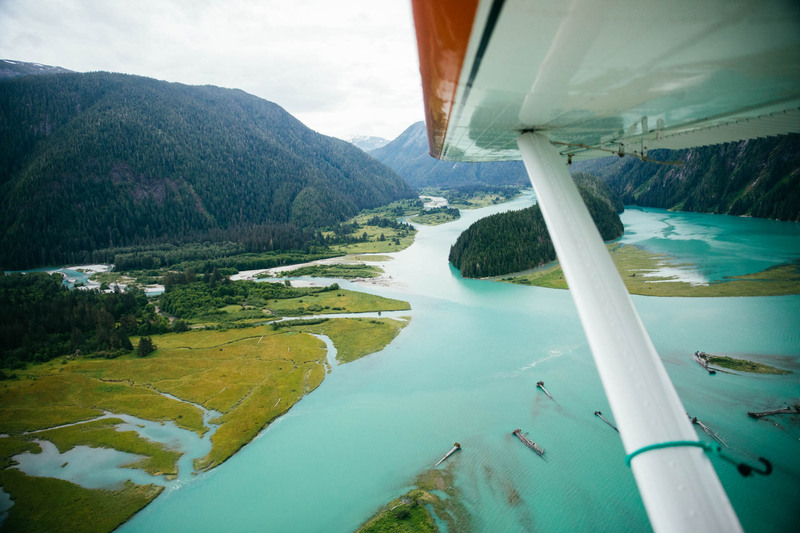 We own and operate one of Canada’s most famous airplanes…the Dehavilland Beaver, come see for yourself and take a tour through the local historic areas and see BC’s largest provincial park- Tweedsmuir! Please call and talk with our staff to find out what is the best tour for you. We welcome those of all ages to come and fly with us. $675 Dehaviland Beaver seats 4 to 6 people. This trip goes south over Francois and Ootsa Lake, into Tweedsmuir Park. Amazing views of lakes, rivers and gorgeous peaks from the air, and an opportunity to see wildlife (moose, goats, bears, caribou). A stop on Blanchet Lake for a walk on the beach or Grizzly Lake to experience some Alpine flora and fauna. Fly west past Nadina mountain and head into the coast mountains for amazing views of glaciers and lakes. Land on Nanika Lake beach at the base of the glacier to prolong your view of the beautiful mountains in a peaceful setting. Atna Peak is a 7,970 ft / 2,429 m mountain peak in British Columbia, with a prominent glacier that is visible through the whole year. A great value tour for a little as $60 per person. Take a tour of the local sights, Boer Mountain, Foxy Canyon, China Nose cliffs, lakes and more lakes. Customize this tour to see points of interest. Tour head west over Decker Lake, Maxan Lake over Foxy Canyon to the China Nose cliffs where you may see mountain goats high up on the rocks. China Nose is 400m high with a healthy goat population that lives on these rocks. Hunlen Fall is Canada’s third highest waterfall– plunging 1,316 feet (401 meters). In fact they are the highest waterfalls in Canada IF you measure as a continuous unbroken drop. The falls drops from the north end of Turner Lake via Hunlen Creek into the Atnarko River, a tributary of the Bella Coola River. Magnificent viewing this wonder from the air, the best way to get a photo! You fly through the Rainbow range… an incredible site that adds brilliant and remarkable colours to the tour. The Rainbow Range is an eight-million-year-old (shield volcano in the Anahim Volcanic Belt which includes the lower but similar Itcha and Ilgachuz Ranges The array of colours are caused by specific minerals involved in the volcanic formation of the range, and the colours glow and change with the seasons. Monarch Mountain is located on the southern boundary of Tweedsmuir Provincial Park. It’s the highest peak in a rugged massive ice-field that is bounded to the west by huge glaciers. Monarch Mountain is a 9,973 ft / 3,040 m of snow and ice with glaciers spreading between peaks. This is a an amazing route to fly with beautiful blue lakes, peaks and endless wonder for the eye to see. Maximum 3 persons, call for pricing. Experience any of our flightseeing tours in a Cessna 185 on skis. Good opportunity to see the beauty of the North and see some moose. Landings are extra. This is a great opportunity to see our landscape in a winter setting from a warm airplane. Bright sunny days make for an amazing tour, and there is opportunity to land on high lakes or tour south for a little ice fishing. This is a custom tour just for you! If you are a skier, bring them along to land on a high mountain ridge to ski down to a lake for pick up.